by Chris Woodford. Last updated: November 20, 2018. When Alexander Graham Bell (1847–1922) spoke the immortal words "Mr. Watson! Come here! I want to see you!" into his primitive telephone in March 1876, he became one of the founding fathers of the modern age of telecommunications. But just suppose for a moment that he'd wanted to send his colleague a picture instead of spoken words—how exactly would he have done it? Most people assume fax machines (which send documents down phone lines) are newer than the telephone lines they use, but the first fax (Alexander Bain's "chemical telegraph") was actually patented decades before the phone in the 1840s. Today, the Internet has largely made faxing obsolete, but many businesses still rely on trusty old fax technology. Let's take a closer look at how it works! Artwork: The basic concept of fax, short for "facsimile": the idea is to create a replica of an original document at the other end of the telephone line. Suppose you have an urgent contract you want me to sign and you need to get it to me as quickly as possible. You could mail it, of course, but that will take at least a day to reach me and another day for me to return it. You could use a courier—but, unless we live near one another, we're still talking about a turnaround time of hours. Or you could send the contract down the phone with a fax machine in a minute or so. Let's imagine for a moment that fax machines haven't been invented, but you still want to use the phone. Suppose you need to transmit a one-page document to me. What can you do? Let's make the problem really easy. Let's say the document can be either a totally black page or a totally white one. Now transmitting the document is really easy. You simply pick up your phone, dial my number, wait for me to answer, and then say either "black" or "white". Okay, let's make the problem a bit harder. Suppose the document is a single page divided into four squares and each of the four areas can be either black or white. Again, it's fairly easy for you to transmit this document. You ring me up and just say "Black black white black", "White black white white" or whatever—and I can instantly recreate the document in my mind's eye at the other end. Now let's make the problem much harder. You have to send to me an entire page covered in black-and-white, computer-printed words. Actually, this problem isn't as hard as it looks. All you have to do is divide the page into thousands of grid squares and then read out, from left to right and from top to bottom, whether each square is black or white. Suppose I'm sitting at the other end of the phone with a piece of paper ruled with an identical grid of squares. As you read out "black", "white", "white", "black", I just need to shade in all the black squares with a pencil and skip the white ones. By the time you get to the bottom of the page, my shaded-in page will look just like yours. If we make the squares small enough, so each one is slightly bigger than a pinhead, I will magically end up with an exact, readable copy of your page. 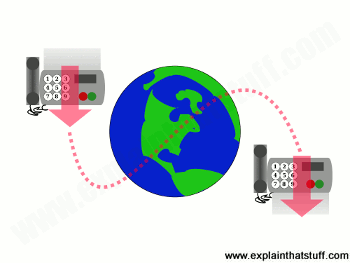 Simply speaking, this is how fax machines work. Well, okay, it's not exactly how they work! A fax machine is designed to both send and receive documents so it has a sending part and a receiving part. The sending part is a bit like a computer scanner, with a CCD (charged-coupled device) that scans only one line of a document at a time, and only in black and white. Crudely simplified, it looks at each line separately, detects the black areas and the white areas, and transmits one kind of electric pulse down the phone line to represent black and another to represent white (just like saying "black" and "white", in fact). The phone line transmits this information almost instantly to a fax machine at the other end. It receives the electrical pulses and uses them to control a printer. If the receiving fax hears "black", it draws a tiny black dot on the page; if it hears white, it moves along slightly, leaving a white space instead. It takes about a minute or so to transmit a single page of writing (or a complex drawing) in this clumsy but very systematic way. 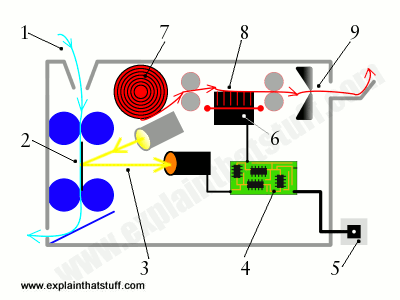 What happens inside a fax machine? Ever wondered what goes on inside your machine when you send or receive a fax? To send a fax, you feed the page into the input slot and it's pulled in between several pairs of rollers. Larger fax machines have built-in document feeders that automatically feed in multiple pages from a stack, so you don't have to stand at the machine feeding in pages one at a time. As the paper moves down, a bright light shines onto it. White areas of the page reflect a lot of light; black areas reflect little or none. The light reflects off the page into a light-detecting CCD (charged-coupled device). The CCD turns the analog pattern of black and white areas on the page into a numeric (digital) pattern of binary zeros and ones and passes the information to an electronic circuit. The circuit sends the digital information down the telephone line to the fax machine at the receiving end. When you receive a fax, the same circuit takes incoming digital information from the phone line and routes it to a built-in printer. The thermal (heat-based) printer, operated by the circuit, reproduces the incoming fax on the paper as it moves past. An automatic blade cuts the page and the printed fax emerges from the output slot. You can see that there are really two separate machines in one: a fax-sender and a fax-receiver. When you use a fax machine to make quick "photocopies" of documents, the two machines link up together: instead of sending a fax down the phone line, the circuit reroutes the scanned data directly to the printer so you get a copy of your original document. 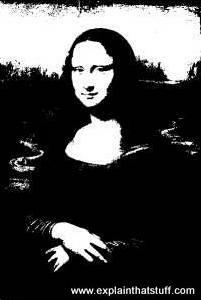 Photo: How a fax machine would transmit a picture of the Mona Lisa. Every part of the image becomes either black or white. Not shades of gray, but crude, binary black or white. You can still recognize the picture, but much of the detail has been lost. This matters much less for text documents than for images. Fax machines come in three basic kinds called group 1, group 2, and group 3. The group number is, broadly speaking, a measure of how fast the machine can send and receive: a group 1 machine sends and receives at the slowest speed (about six minutes per page), group 2 can manage a page in about three minutes, and group 3 zips along at a minute or less per page. When a fax machine first dials another fax machine, there's a short (typically 15–30 second) period of handshaking where the machines agree on the speed they will use for the transmission. It's always the slower machine that governs the speed so, even if you have a fast group 3 machine, it will still work at the slowest possible speed if you're sending faxes to (or receiving faxes from) a group 1 machine at the other end of the line. The great thing about faxing is that it's very simple: just put your document in the machine, dial the number, wait for the other machine to reply, and hit the START button. Receiving a fax is even easier: assuming your machine is set to AUTO, you don't need to do a thing. But there are some drawbacks too. Most fax machines use low-cost thermal printers that burn images into heat-sensitive paper (fax machines like this typically use tight rolls of paper rather than sheets). The paper is quite expensive to use, fades very quickly, and can't be recycled in the usual way. It also takes a long time to send a fax: if it takes a minute per page, a 30-page document will take over half an hour to transmit. Another drawback is the crudeness of faxed documents. A fax machine senses areas of black and white by shining a bright light onto the page it's transmitting and using photocells (light-sensitive electronic components) to measure the light reflected back again. The photocells transmit when they see white areas and don't transmit when they see black. In other words, they can't distinguish shades of gray (or what printers call "half-tones"). That means a photograph or artwork sent by fax will lose much of its detail and may even become completely unrecognizable at the other end. For all these reasons, many people now prefer to send documents as email attachments. They're quicker and more convenient, you can print them out (or not, as you wish) on decent paper, and you can send and receive things in full-color and shades of gray. Some telephone companies also offer fax-to-email services where you're allocated a unique telephone number. If someone faxes you on that number, the company receives the fax for you at a central computer complex, converts it into an image file (such as JPG or TIFF) or PDF, and then forwards it on to you by email. In much the same way, most computers that have a dialup (fax) modem can also send faxes to people very easily without extra equipment. So, dated though it may be, fax technology is probably here to stay for a few more years yet! 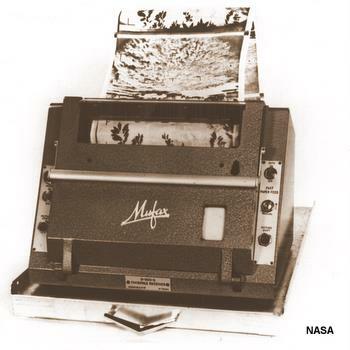 Photo: Back in the 1960s, meteorologists started using early fax machines, like this Muirhead Mufax, to receive weather charts from satellites through a radio-broadcast system called Automatic Picture Transmission (APT). Photo courtesy of NASA on the Commons. 1840: Samuel Morse (1791–1872) is granted a patent for a simple electric telegraph that revolutionizes international communication (US Patent 1647: Improvement in the mode of communicating information by signals by the application of electromagnetism). 1843–1850: Scotsman Alexander Bain (1811–1877) develops two different types of primitive document-sending machines, based on the telegraph: one is electromechanical, while the second uses a mixture of chemical and electrical technology. Bain's ideas are further improved by Englishman Frederick Bakewell (1800–1869), who introduces the idea of rotating cylinders—still used in fax machines to this day. 1865: Giovanni Caselli (1815–1891), an Italian physicist, develops a more practical electromechanical method of sending documents down telegraph wires. He calls his invention a Pantelegraph, a portmanteau of "pantograph" and "telegraph," because it copies documents (using a pantograph) and sends them by telegraph. 1876: Alexander Graham Bell (1847–1922) files his telephone patent (US Patent 174,465: Telegraphy) on February 14, 1876. Whether he deserves all the credit for inventing the telephone is still disputed, but he certainly helps it to become an essential piece of global communication technology. 1920s: Western Union, RCA, and Associated Press develop rival wirephoto technologies, which allow photographs to be sent down ordinary phone lines. 1930s: Telex (a way of sending text messages down telephone lines between teleprinter units that look like oversized typewriters) is pioneered in Berlin by Siemens and the German Reich mail service, later spreading to Europe and the rest of the world. 1964: Xerox uses its experience inventing photocopiers (originally called xerography machines) to develop a document-transmitting system called Long Distance Xerography (LDX). 1964: Meteorologists start using Automatic Picture Transmission (APT) to receive charts from a weather satellite on fax machines. The first broadcast, from the Nimbus-1 satellite, is on August 28, 1964. Late 1960s/early 1970s: Thanks to further innovations by pioneers such as Xerox, the first self-contained fax machines begin to appear, though they're still relatively big (the size of a large modern, office photocopier) and expensive. 1980: Canon, the Japanese electronics company, announces its very first compact fax machine, the FAX-601. During the 1980s, affordable, personal fax machines, virtually all of them made in Japan, power the fax revolution, quickly making telex obsolete. 1990s: The rapid growth of the Internet means millions of people suddenly have access to small fast modems, which enable an ordinary PC to send and receive documents as faxes. Fax Machines by Jonathan Coopersmith, Associate Professor of History at Texas A&M University. Engineering and Technology History Wiki, 2015. A very good account of the development of fax technology, from the 1840s to the present day. For even more detail, see Jonathan Coopersmith's book, below. Faxed: The Rise and Fall of the Fax Machine by Jonathan Coopersmith. Johns Hopkins University Press, 2015. A fascinating chronological history that places fax in the wider context of communications technology. Fax, Modem, and Text for IP Telephony by David Hanes and Gonzalo Salgueiro. Cisco, 2008. "Chapter 2: How fax works" will give you a deeper technical overview of things like fax modulations, the different stages of a fax call, how information is transmitted in frames, and so on. Later chapters cover related issues like fax servers and store-and-forward fax. FAX: facsimile technology and systems by Kenneth R. McConnell, Dennis Bodson, and Stephen Urban. Artech House, 1999. Leeds NHS trust has 345 fax machines. I want to get rid of them by Richard Corbridge. The Guardian, October 25, 2018. Fax machines might seem charming and retro, but in hospitals, where their use is still very widespread, they can be positively dangerous. In High-Tech Japan, the Fax Machines Roll On by Martin Fackler. The New York Times, February 13, 2013. Fax is a dependable and reassuring technology—and the Japanese see no good reason to let it go. The Age of the Fax Machine Is (Finally) Coming to an End by Nicholas Jackson. The Atlantic, 2 August 2011. One writer who particularly hates fax machines! Who still uses fax machines (other than Mia Farrow fans)? by Stephen Moss. The Guardian, 14 July 2009. Why we should celebrate the fax machine as it quietly slips into history. Burning Question: Why Are Faxes Still Around? by Eric Hagerman. Wired, 22 December 2008. Faxes still have their uses, especially when other technologies fail us. Fax—the technology that refuses to die by Paul Rubens. BBC News, 15 December 2003. Why does faxing remain popular when email has made it obsolete? The fax machine uprising by Giles Turnbull. BBC News, 24 June 2002. How fax machines played an important part in a campaign to cripple digital privacy laws. Facsimile transceiving apparatus by Peter Mason et al, Xerox Corporation, 4 March 1975. One of the earliest modern-style fax machines, in which a laser beam scans a document and transmits it by video to another location. Compact facsimile machine by Shigeru Kadomatsu, Ricoh Co. Ltd, 16 December 1986. Describes a modern fax machine with all the components built into a single desktop case. Network fax machine using a web page as a user interface by Xiaoan Hou et al, Ricoh Co. Ltd, 20 February 2007. Describes a modern web-based fax server operating over a local area network (LAN). Secret Life Of Machines: The Fax Machine by Tim Hunkin. A 30-minute clip from the excellent series by the quirky British cartoonist. His human demonstration of faxing is quite similar to the one I've described above.